Why should GOSSIP be a bad thing? Now just because GOSSIP has been frowned upon and is perceived as a negative behavior, doesn’t mean that it can’t be used in a positive way. 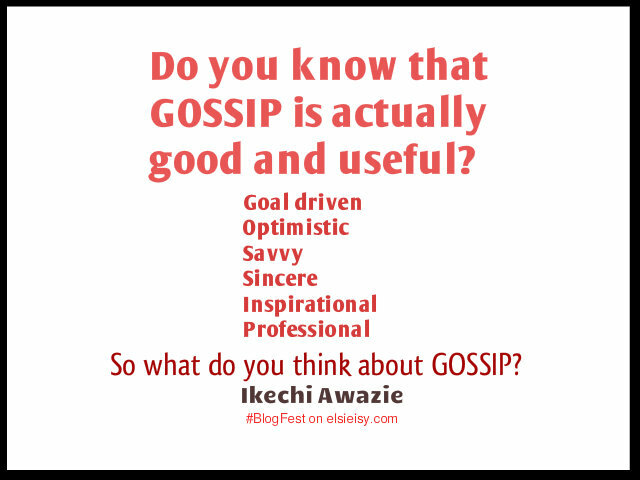 Do you know that GOSSIP is actually good and useful? Do you know that GOSSIP is what makes human society as we know it possible? The Research on the positive effects of GOSSIP is so much on the increase. Scientist has finally deduced that GOSSIP is not just about humiliating or making people to cry, it is life-enhancing and life-saving. It also can have a positive impact on health, success and even team cohesion at work. If you have never developed goals before, then here is a treat for you. If you don’t always feel motivated, your attitude is always slagging and you have always been procrastinating, then you need to embrace GOSSIP. As soon you do so, you will begin to achieve your goals almost immediately. Your determination will be on hyper mode. You will become super focused and inner driven. Do you always believe in negative thoughts, then GOSSIP will save your day. You are never going to have an aura of negativity again. You will always see the best aspect of life and your world will always be full of Bliss and opportunities. I am not talking about having theories and what some people will call head knowledge. GOSSIP enables you to have so much practical understanding on any field of your interest. It is the sure way to the journey of Wisdom. Don’t miss this opportunity. Do you know that when you participate in GOSSIP, you can infer things about yourself and also evaluate yourself without having to test everything directly? According to Research, GOSSIP is being considered as a way to learn about Cultural norms, bond with others, promote co-operation and even allow an individual to gauge their success and social standing. You get to make a difference in your world. You get to inspire action, cause a ripple effect and spark curiosity among others. GOSSIP will enable you to be more generous. You will be able to get rid of selfishness and sustain co-operation among all. GOSSIP has also been known to boost social skills. The wonderful thing about GOSSIP is that you become an expert. You become a pro and authority. You get to be the one that solves problems for others. So what do you think about GOSSIP? Goal driven, Optimistic, Savvy, Sincere, Inspirational and Professional. Are you willing to embrace Gossip and make a difference? Please share your opinion. Weldone Ikechi, When i started reading i was wondering what you are on about…lolNice twist. Guess i am on a long fun reading this season…Elsie! *clears throat*Elsie I need water..Elsie I saw something today eh…I no fit talk am…They were just mashing n husshing abt Elsie Godwin becoming super finer this days…That she even has more energy n charisma now…That she is even …And I had to drop 2 bustops after mine before my money no go do me to reach my house…Truthful and positive gossip I like oh SpiritMan speaks …. I like it though. Everybody gossips but I guess we’ve never thought it can be done in a positive way. Thanks for this post. Very true indeed. Everyone should pick some knowledge from this post.